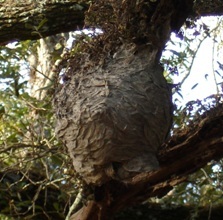 Log home owners beware: this has been a particularly bad year for yellow jackets. Our crews have been bothered by them a lot as they go about repairing log homes. They can be a real nuisance, especially when you run into them unexpectedly. Unlike a honeybee which can only sting once, yellow jackets can sting multiple times. The one on the left is a yellow jacket and on the right is a honeybee. Yellow jackets are wasps, not bees, though they are often confused with honeybees. Yellow jackets are not picky about where they set up home; they build nests both above and below the ground. Since they are often referred to as bees, they have given honeybees a bad name when it comes to dealing with them. 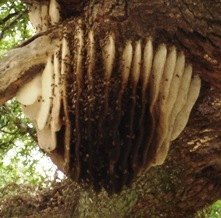 If you have these wasps, there is a great deal of information available on how to remove them. If you think you have honeybees nesting near your home and you want them removed, contact a local beekeeper who might be able to capture them and incorporate them into their apiary. The bottom line: yellow jackets do NOT make good neighbors.